Penn State researchers are engineering a dramatically longer-lasting, faster-charging and safer lithium metal battery design. Described in Nature Energy the researchers developed a three-dimensional, cross-linked polymer sponge that attaches to the metal plating of a battery anode. 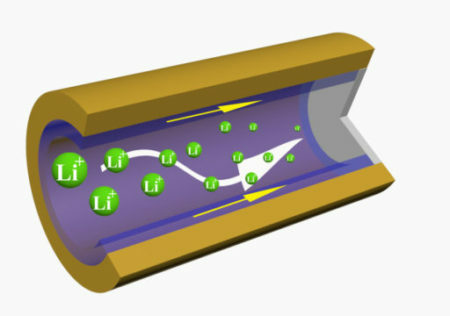 A three-dimensional cross-linked polymer sponge attaches to the metal plating of a lithium ion battery anode, allowing ion transfer and limiting deterioration. Image Credit: Donghai Wang, Penn State University. Click image for the largest view. Under additional strain, like in the fast-charging methods desired in electrical vehicles, lithium ion (Li) batteries are vulnerable to dendritic growth – needle-like formations that can reduce cycle life and potentially cause safety issues – including fires or explosions. Your humble writer sure hopes Wang has a major win. Here the outside temperatures make the lithium ion smartphone battery a short day device unless carried inside the coat. One isn’t seeing batteries of any kind developing full energy output. The electric vehicles are driven only from heated garage to heated location or risk getting stranded. The low temperature assistance from this technology will be much more than welcome. If the temperature levels are low enough and the performance high enough electrification could get a very large boost. especially if it applies to mobile. add that “alarmist” comment was unnecessary. But I guess that is what writers do.